Bushnell 121225 Legacy 10-22x50 Waterproof Binoculars 121225 FREE SHIPPING! 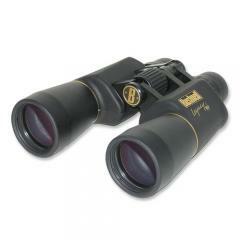 These Bushnell Legacy 10-22x50 binoculars provide extreme optical performance in a durable, weatherproof platform. Its BaK-4 Porro prisms and premium multi-coated glass optics minimize reflection to direct as much light as possible to the eye, creating a clear, bright, high-contrast image. Combined with their powerful variable magnification and wide field of view, this gives them superior performance on surveillance operations. A simple center focus system makes it easy to achieve a sharp image of your target. The binoculars come with tough rubber armor that protects against impacts and also provides a secure, non-slip grip. ©2002-2019 CopsPlus.com: Bushnell 121225 Legacy 10-22x50 Waterproof Binoculars 121225 FREE SHIPPING!